Electron micrograph (26,500x) showing transcription of the DNA encoding ribosomal RNA (rRNA) molecules in the nucleolus of a developing egg cell of the spotted newt. Eukaryotes have several hundred identical genes encoding ribosomal RNA. 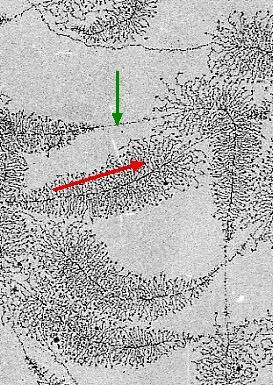 The long filaments (green arrow) are DNA molecules coated with proteins. The fibers extending in clusters from the main axes are molecules of ribosomal RNA which will be used in the construction of the cell's ribosomes. Note how transcription begins at one end of each gene, with the RNA molecules getting longer (red arrow) as they proceed toward completion. Note also the large number (up to 100) of RNA molecules that are transcribed simultaneously from each gene.